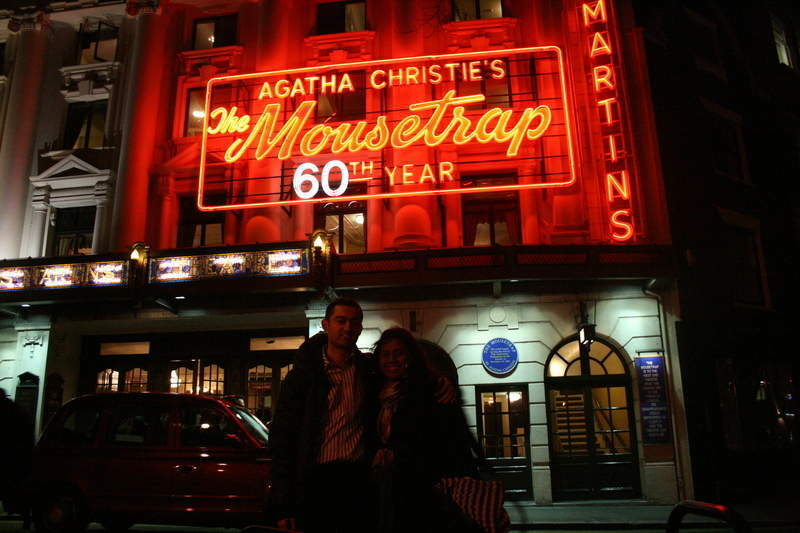 Getting the opportunity to watch the world's longest running play, "The Mousetrap" at Saint Martin's theatre, was a great feeling. 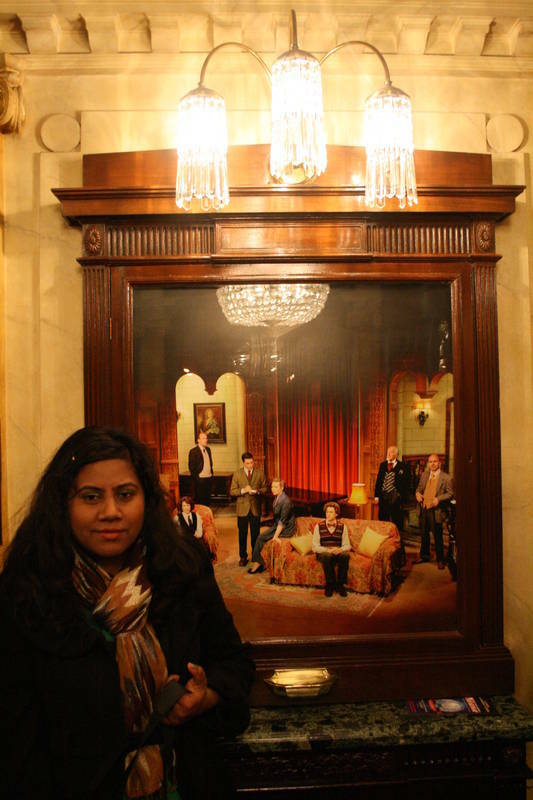 It was Valentine's day in 2012 and I was going to watch an English play for the first time in my life. I was also excited about the fact that it was going to be the second surprise for my wife on the Valentine's day. I surprised her by sending a bouquet of roses, a card and chocolates at her work desk in the morning. The play was hopefully, going to be the 2nd surprise. Well, its usually her who does all the surprising and the lovey dovey stuff but this time I was given the responsibility, probably for the first time ! I only told her that we would be going for dinner and didn’t mention about the play. She had mentioned to me quite often about how she wanted to go to the theatre. So, according to my plan, I asked her to come to Leicester square tube station (which lies on the Picadilly and the Northern line) at around 17:00 Hrs so that we could have pre theatre dinner as I had to wake up at 04:15 am the next day for work. 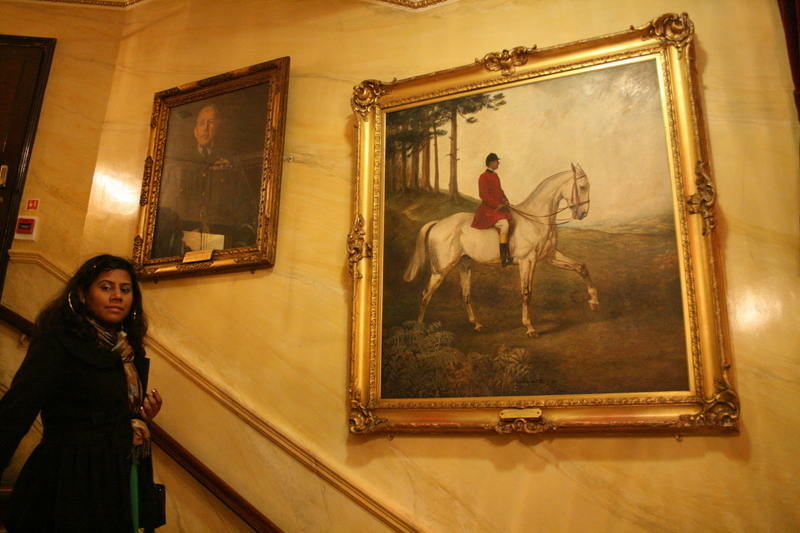 As her mood was not quite good since 2 days, she was not showing much interest in having dinner in central London. She said, "What's the point in travelling so far from Hounslow to central London just for the dinner. Can't we have it somewhere nearby our house?". I was a bit worried about the timings, as the show was going to start at 19:30 or 07:30 pm and we had to be present at the box office by 19:00 or 07:00 pm. I was worried about the fact that if she didn't turn up it would all go in vain. Hence I lied to her saying that "I have already booked a table for two and have paid £50 which is not refundable !". She said, "Well,ok. I am getting ready and will be there by 18:30". In the meanwhile, I went to the theatre and got the 2 tickets for which I had paid beforehand. So, I showed the email confirmation printout at the counter and got two upper dress circle tickets. I went there at 18:15 and though they mentioned that one could collect the tickets at the box office at 19:00, it was already opened at 18:15. It might be due to the valentine's day rush, not sure though. 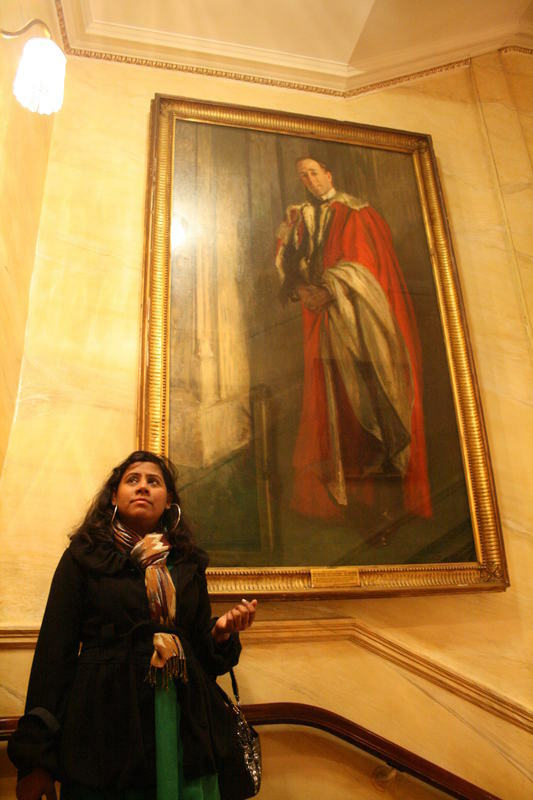 My wife, Shruti, arrived at 18:30. I greeted her and she thanked me for the flowers and we headed towards the Theatre. I told her that its good that she managed to make it on time otherwise our table reservation might have been cancelled. She didn’t react much and said, "Never mind, we can always find some place to eat". By the way, here is how one can get to St. Martin's theatre from Leicester square tube station : After I got off at Leicester square tube station, as guided by the underground official, I took exit 4 and the first set of staircase to the left. After climbing the stairs, I took a right and after about 2 to 3 minutes there came a big enough right turn. There is a "Subway" joint at the right turn. A few minutes before the right turn, I also saw a Chinese herbal medicine shop. So, I took the right turn and the theatre was right in front of us. Just so that she does not get a hint, I apologized to her and mentioned that I couldn't get tickets to any of the theatres as due to Valentine's day, all the tickets were sold out. 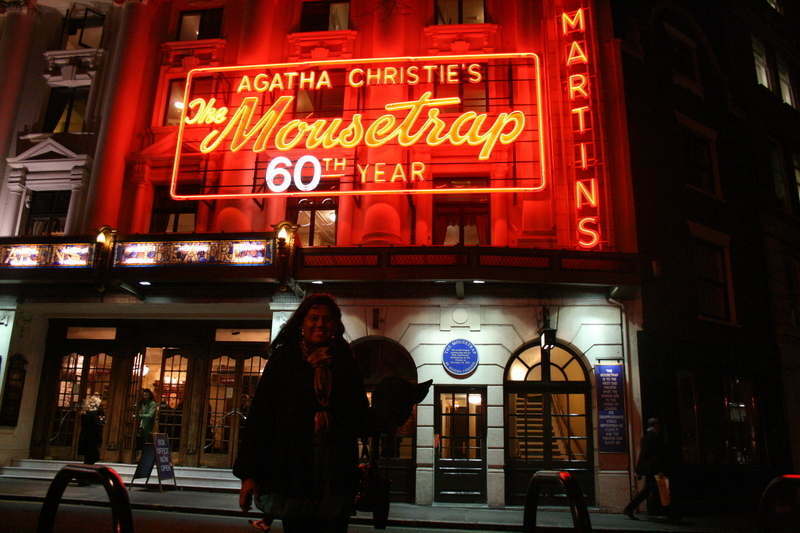 She looked at the theatre on which it was written in bright red big font "The Mouse trap celebrates 60 years ! ", and said, "I wish we could have gone to watch this :(". I said, "Its okay, we can always go some other time". We walked parallely to the glass doors of the theatre, watching through it and left the doors behind and walked a bit more. After a while I held her hands and told her that I knew a shortcut and turned back and took her right into the theatre :). She was a bit confused and initially thought me of going in for nature's call or something :P. But when I showed her the tickets, she couldn’t believe it for a moment. Her mood changed suddenly and she was quite happy and thanked me for the surprise. Since we had been to a theatre for the first time, we were looking around curiously. 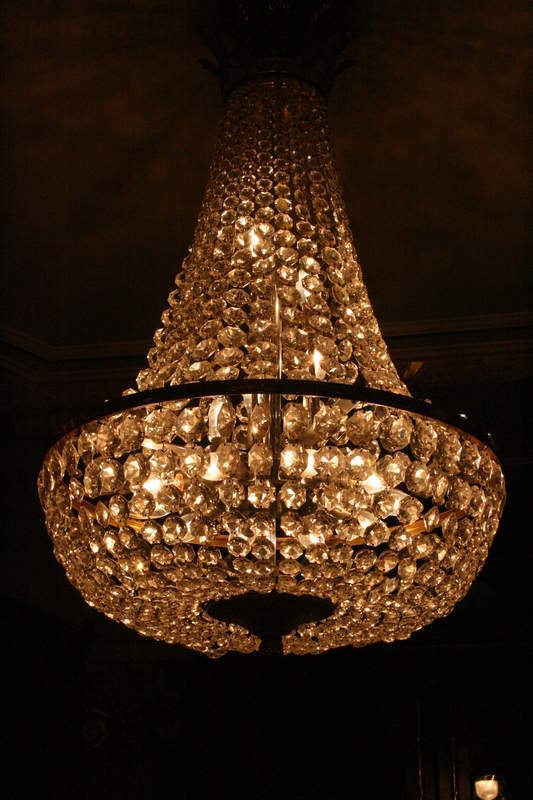 The interiors reminded me of the olden days. There were photo frames of the actors who play and used to played in the play and a bit of their history. There was a small counter near the main doors for refreshments and a bar upstairs. While going to the bar I took a few snaps of the huge portraits hanging on the walls. By the way, I enquired if photography was permitted in the theatre and the lady at the counter told me that it is allowed. She obviously meant that photography is allowed in the theatre but not in the play hall. However, just before the play began and the curtains were still on, I saw many clicking pictures with their mobile phones. There were security guards at the gates, handing over information booklets to the ones interested. They were not free though. I guess the small ones were for about £2 to £4 (pounds) and the bigger ones were for about £10. Our seats were at the top in thelast row. There was a separate entrance for the upper dress circle seats. We took our seats at around 19:15 and the play began at about 19:35. Just after about 5 to 10 minutes past the start of the play, I got a feeling of deja vu and felt as if I have seen this play before. Same story, same hotel, same plot, same characters ! Just after a few minutes, I realised that a few years ago I had watched a Marathi Natak (Marathi is the local language of the state Maharashtra in India and Natak means play in Marathi). Well I love watching movies but I hardly watch plays. mentioned about this suspense Marathi play. And strangely it was being compared with some other English play, which was Agatha Christie's as well. 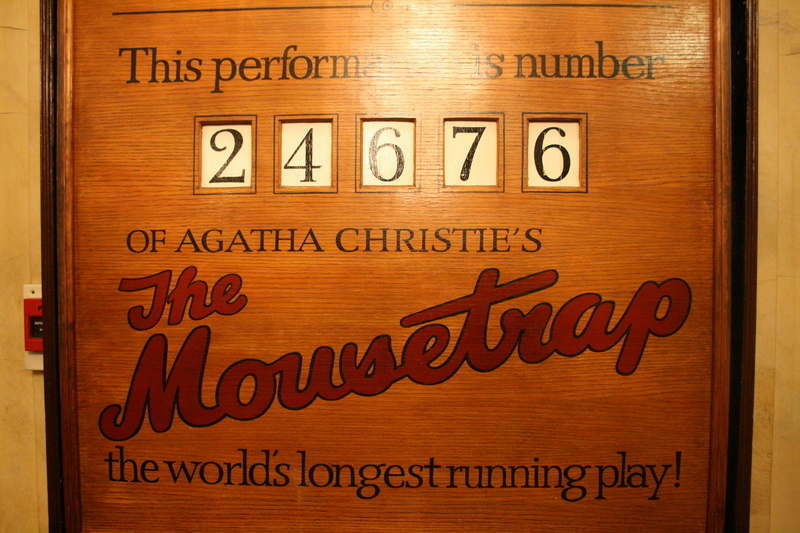 But when I came to know about the title of the play I was certain that this Marathi play was certainly 'inspired' by Agatha Christie's "The mousetrap" because the Marathi play's name was "Trap" ! Well I would like to mention here that, its not that I didn't enjoy watching the Marathi Natak. It was also very well directed and presented and interesting. I would also like to mention that out of the many states in India, according to my knowledge, Marathi and Bengali theatre are the best, in India. Coming back to the English play, its total duration was 2 hours and 15 minutes. There was a break of 15 minutes between the two hours. Along with the seriousness and the suspense element, there were plenty of funny bits as well. All acted superbly. There wasn't a single flaw. The play moved ahead as smoothly as a movie ! I truly enjoyed the show and was more happy to see my wife pleasantly surprised on Valentine's day. I personally like suspense shows and would definitely recommend everyone to watch it at least once. After the movie we had a nice dinner at an Italian restaurant nearby. Before I finsih, I would like to request you all to not disclose the suspense (murderer) to anyone who has not watched the play. We'd been requested to do the same by the play members after the play finished. Information related to address, run times, Opening and closing hours etc can be found in the immediately above links and the above article.